Sir Arthur Helps (1813-1875), Essayist and historian. Sitter in 3 portraits. 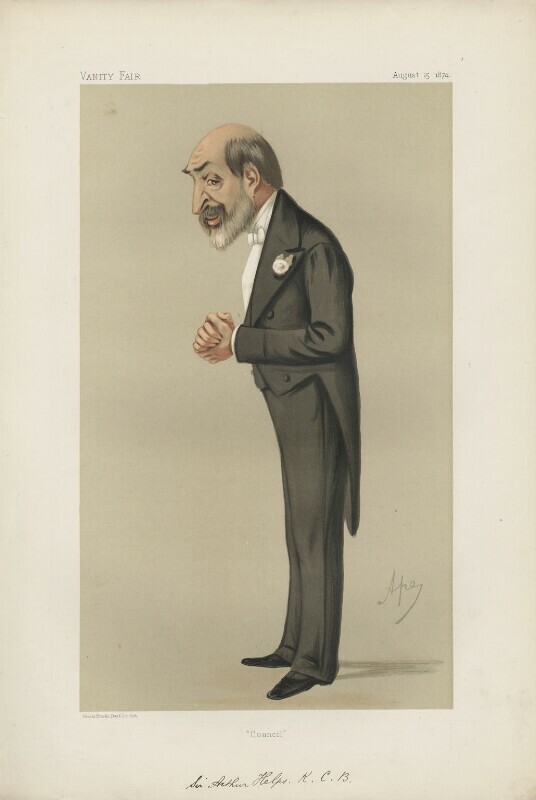 Carlo Pellegrini (1839-1889), 'Ape'; caricaturist. Artist associated with 483 portraits, Sitter in 5 portraits. Disraeli becomes Prime Minister for the second time, winning the general election and giving the Conservative party its first absolute majority since the 1840s. Professional opportunities for women develop, with the opening of the London School of Economics to women, the foundation of the London School of Medicine for Women and the Women's Protective and Provident League. The Anonymous Society of Painters, Sculptors, Printmakers, etc., including Claude Monet, Edgar Degas, and Camille Pissarro organise an exhibition in Paris. Art critic Louis Leroy gives the group its name, criticising Monet's Impression, Sunrise for being merely an unfinished 'impression'. Impressionism becomes recognisable for techniques such as short, broken brushstrokes barely conveying forms, pure unblended colours, and an emphasis on the effects of light. Britain annexes the Gold Coast, the region on the Gulf of Guinea in West Africa, now the independent nation of Ghana, following the second Ashanti war. The Treaty of Fomena secured massive financial reparations for the British, and strengthened their hold on the prosperous resources and trade routes in the regions. However, weakening the Ashanti tribe greatly destabilised the area.